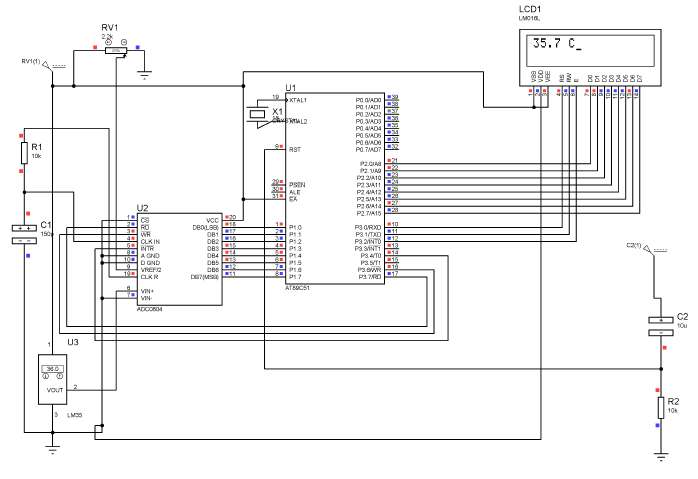 This simple project interface LM35 which is a very common Temperature Sensor giving high precision reading in terms of Analog Voltage with most popular 8051 Microcontroller AT89C51. LM35 gives analog reading and microcontroller process digital data so we have to use a midway converter from Analog to Digital i.e. AD0804 and display the result of a temperature on LCD. An analog-to-digital converter is a device that converts a continuous physical quantity (usually voltage) to a digital number that represents the quantity’s amplitude. From ADC these digital signals are sent to Microcontroller which displays the temperature of that environment. These A/Ds have been designed to accommodate a 5 VDC, 2.5 VDC or an adjusted voltage reference. This has been achieved in the design of the IC as shown in Figure. Notice that the reference voltage for the IC is either 1⁄2 of the voltage applied to the VCC supply pin, or is equal to the voltage that is externally forced at the VREF/2 pin. This allows for a ratio metric voltage reference using the VCC supply, a 5VDC reference voltage can be used for the VCC supply or a voltage less than 2.5 VDC can be applied to the VREF/2 input for increased application flexibility. The internal gain to the VREF/2 input is 2, making the full-scale differential input voltage twice the voltage at pin 9. An example of the use of an adjusted reference voltage is to accommodate a reduced span—or dynamic voltage range of the analog input voltage. If the analog input voltage were to range from 0.5 VDC to 3.5 VDC, instead of 0V to 5 VDC, the span would be 3V. With 0.5 VDC applied to the VIN(−) pin to absorb the offset, the reference voltage can be made equal to 1⁄2 of the 3V span or 1.5 VDC. The A/D now will encode the VIN(+) signal from 0.5V to 3.5 V with the 0.5V input corresponding to zero and the 3.5 VDC input corresponding to full-scale. The full 8 bits of resolution are therefore applied over this reduced analog input voltage range. ADC reads the temperature from LM35 sensor whose voltage is a function of present room temperature. When temperature is 20 degree it send 200mV to ADC and we have used Vref/2 pin to 700mV or changeable value for span adjustment. 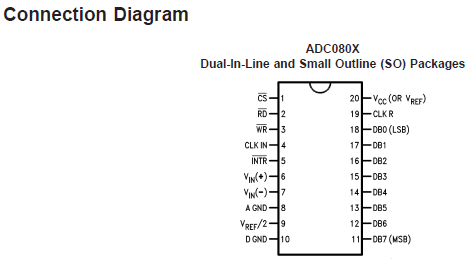 ADC translates the 200mV to digital and send it to AT89C51. double adc()  // Function to read the values from ADC and send to controller.